The 13 true seniors (and one redshirt junior) that make up 45 percent of the roster for No. 3 Florida Gators lacrosse ensured their legacies were cemented by rallying together and annihilating the defending national champion No. 4 Northwestern Wildcats 22-4 on Saturday at Donald R. Dizney Stadium in Gainesville, FL to capture the program’s third-straight American Lacrosse Conference regular season title. Florida’s seniors scored 15 of the team’s 22 goals on the afternoon but were led by sophomore Shannon Gilroy, who found the back of the net a team-high five times. The Gators (16-1, 5-1 ALC) handed the Wildcats (13-2, 4-1 ALC) the most lopsided loss in their program’s history. Florida’s 22 goals were also the most that have ever been allowed by Northwestern in a single game. 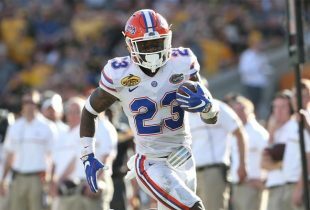 Saturday’s victory marked UF’s third-straight against its ALC rivals and fourth in the last five meetings dating back to the 2011 season. The Gators also concluded the regular season a perfect 9-0 at home. Senior attacker Gabi Wiegand led her class with four goals. Classmates Ashley Bruns, Kitty Cullen and Brittany Dashiell registered three each. Fellow senior Caroline Chesterman added two goals, as did sophomore Nora Barry. Of course, Florida would not have been as dominant on Saturday without the work of senior goalkeeper Mikey Meagher, who fended off 18 shots, made five saves and only allowed four goals on the afternoon. Wiegand, a transfer from Richmond, was not a member of UF’s original recruiting class but has been an integral part of the team’s success this season. Redshirt junior Hayley Katzenberger, who missed both the 2010 and 2012 seasons due to injury, was also honored alongside her classmates. “They’re just a really special group. They’re just different kinds of leaders and it just works,” O’Leary said. “I have to credit the entire team though. These seniors are a phenomenal group. They’re great role models. Now that the 2013 regular season is in the books, the Gators will turn their attention to the 2013 ALC Tournament, which begins on May 2 in Baltimore, MD. Adam, why is there a Georgia ad in the banner on this page? I know marketing is tough but damn.